Alexis Simko, Tyler MacDonald, Ashley McGowan, Jessica Perez, Emilie Hofferber, Ashley Jannasch at the 2013 Jade N. Riedel Scholarship ceremony on March 21, 2013 at the von Liebig Art Center. 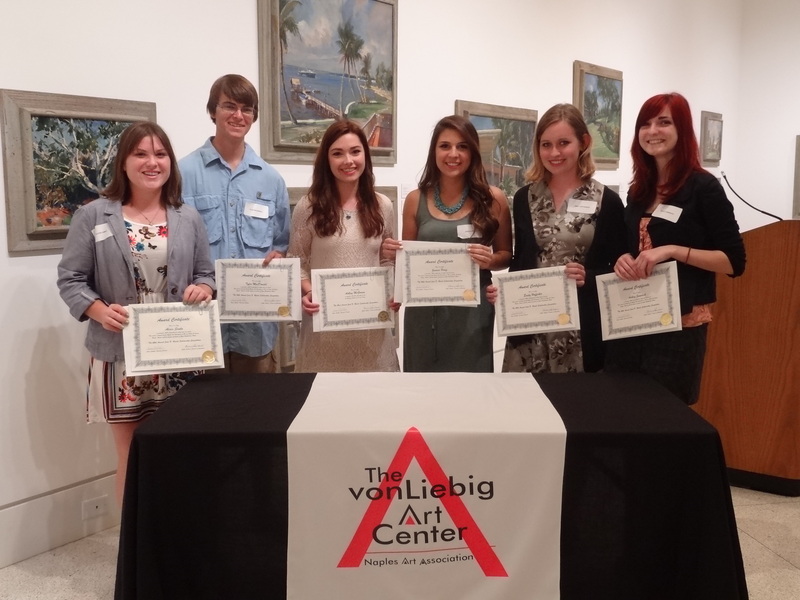 The Naples Art Association awarded $8,000 in merit-based scholarships to Collier County High School seniors on Thursday, March 21, 2013 at a ceremony at the von Liebig Art Center. Young artists were invited to submit works of art to the competition, which was open to all junior and senior art students in Collier County. Seniors planning to further their art education at the collegiate level were eligible for one of six $500 scholarships. Seniors who had been accepted to Ringling College of Art + Design were also considered for a $5,000 scholarship. 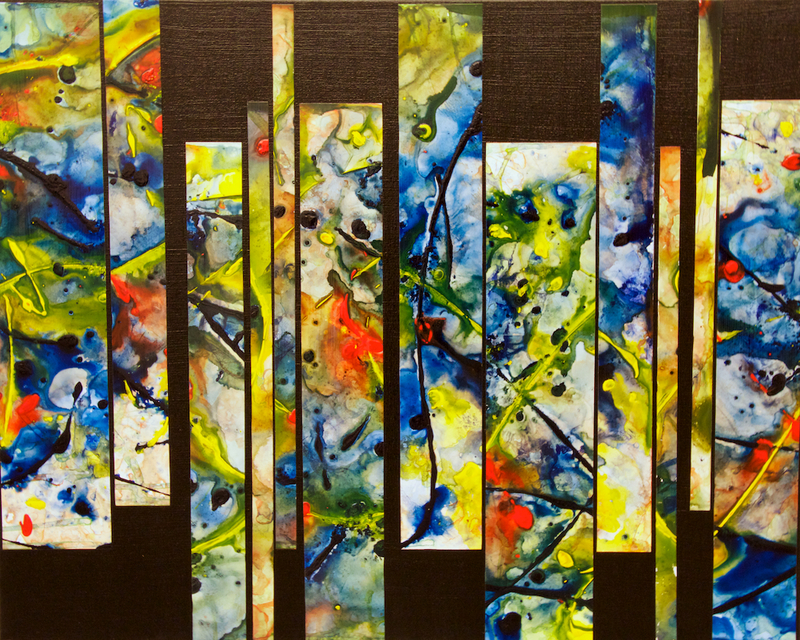 In addition, all 29 Jade Riedel Scholarship artists now have their work on display at The von Liebig Art Center through April 13, 2013. This year’s jurors were Dr. Larry R. Thompson, President of Ringling College of Art + Design, and Gallery Owner Roger Baker. A $5,000 scholarship to attend Ringling College of Art + Design was awarded to Barron Collier High School senior Ashley McGowan. Jade N. Riedel Scholarship competition began in 1971 when members of the Naples Art Association initiated a college scholarship program designed to encourage young aspiring artists to realize their dreams of becoming professionals in the visual arts. The scholarship’s namesake, Jade N. Riedel was an exceptional artist and Naples Art Association member who served as the chair of the scholarship exhibition program and was its chief fundraiser for many years. When she passed away in 1997, the Association renamed the scholarship in her memory. The program has continued thanks to generous donations made during exhibitions, special events and festivals. Follow the Naples Art Association on Twitter. Outreach is an important part of the Naples Art Association’s programming. In this photo, children from Grace Place took center stage. JAMA, an artist recently featured with the Naples Art Association, taught an art class for these children. 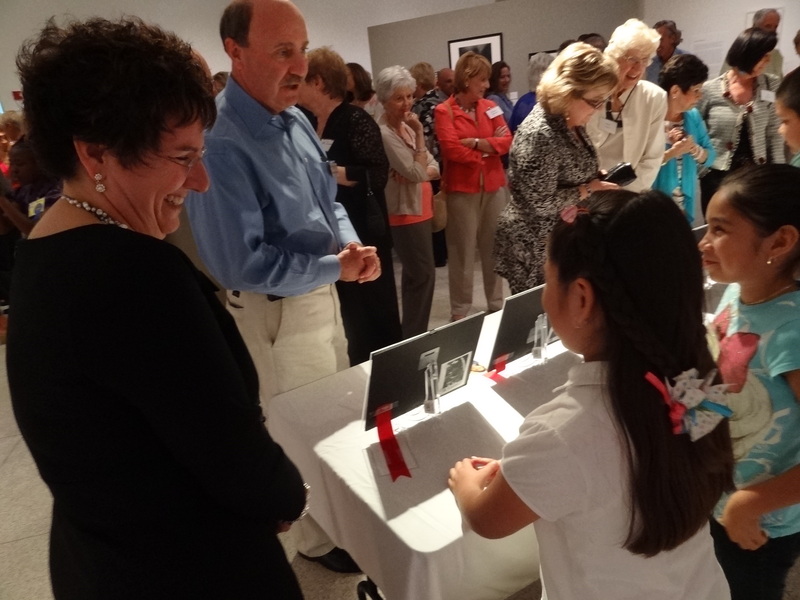 The NAA hosted them afterward with an evening reception and exhibit at the von Liebig Art Center afterward. Here is Executive Director Aimee Schlehr at left talking with one of the young artists. The Naples Art Association supports several organizations and events this season that are engaging people with social, physical or developmental barriers to creating works of art. “Art is intuitive to each one of us, regardless of socio-economic status, training or natural ability, and is an expression of who we are,” said Aimee Schlehr, executive director of the Naples Art Association. 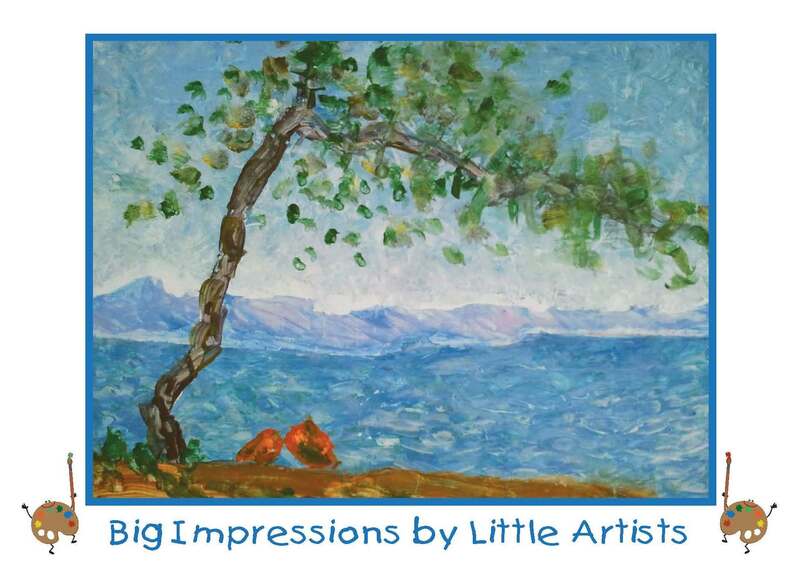 Big Impressions by Little Artists, March 7, 5:30 – 8 p.m. This preschool painting bears striking similarity to Monet’s Antibes. Groups of children ages 3-5 quickly painted the dynamic skywash and seascape, while the tree was detailed by petite perfectionist painters Sydney, 5, and Sophia, 4, with small brushes and fingerprints. Members of the CCCR Business 100 and the Naples Art Association will serve as hosts of the event, Big Impressions by Little Artists, which will benefit Collier Child Care Resources, Inc. This fundraising event will feature paintings created by toddlers to pre-school children, a live auction, hors d’oeuvres, refreshments and live entertainment. Tickets are $50. Proceeds will help provide scholarships for children in need and supplies for the childcare centers served by CCCR. Information or to purchase tickets, call 239-643-3908. Collier Child Care Resources, Inc., (CCCR), is a private, non-profit child care agency that serves children, families and early learning professionals. We have had offices in Collier County since 1991 and expanded our offices to include Immokalee in 2001. Their mission is to support the needs of Collier County’s children, families and early learning professionals by providing high quality education, resources and child care services. 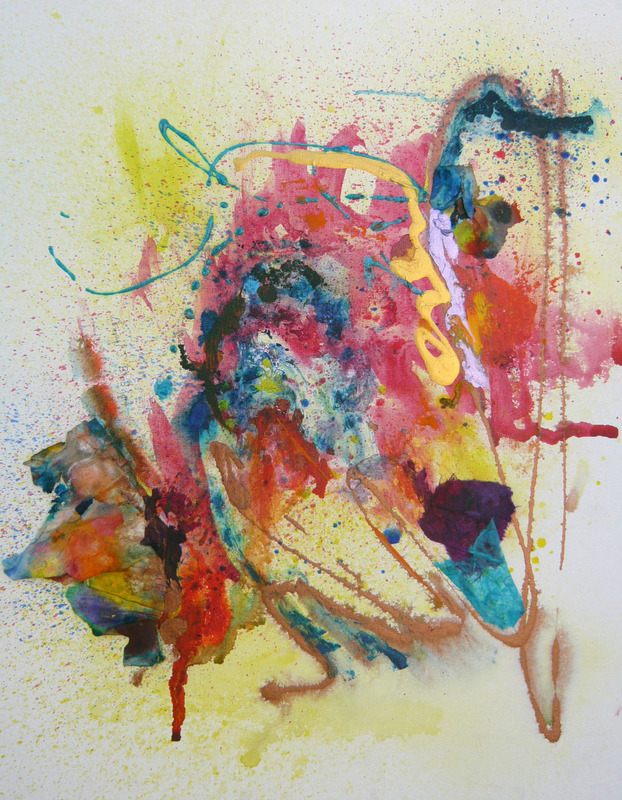 Hattie Larlham Creative Arts showcase, March 15, 5 – 7 p.m.
Come see paintings and sculptures at a special reception hosted by the Naples Art Association at The von Liebig Art Center in Naples, Fla., on Friday, March 15 from 5–7 p.m. The event is free and open to the public. During the Friday evening reception, artwork from Hattie Larlham Creative Arts will be on display in The von Liebig Art Center’s main Watson Gallery. Hattie Larlham Creative Arts is a nationally renowned art program that empowers people with developmental disabilities to communicate through artistic expression. 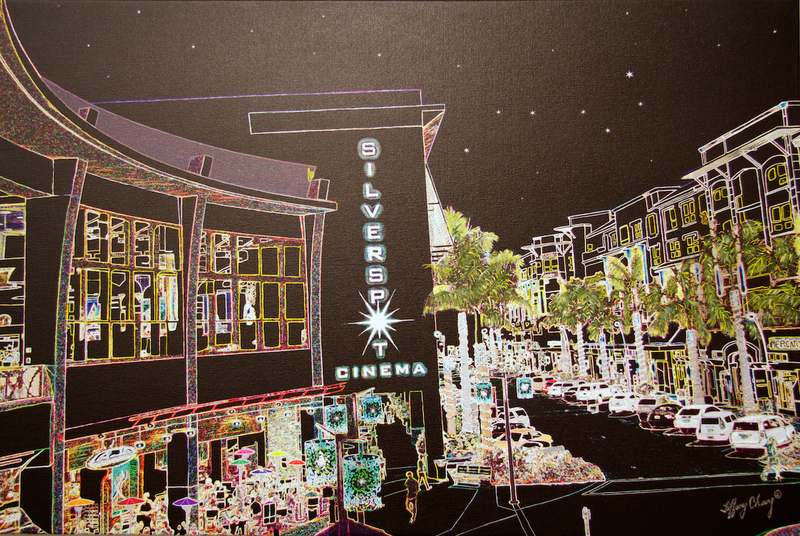 The program began near Cleveland, Ohio, in 2007 with six artists with developmental disabilities and has grown to serve 87 people who produce artwork that is often juried at national art shows, including the upcoming Gulf Coast Fine Art Festival. Events produced by partner organizations such as Collier Child Care Resources and Hattie Larlham Creative Arts emphasize the fact that every person is intrinsically artistic and through art everyone has a voice. “I think people will come away from these receptions with a better appreciation for art as a language form, and this event is especially impressive because preschoolers are producing these fantastic works of art,” she said. For more on the Naples Art Associations’ community partnerships and programming supporting students to pursue the art careers, here is more on Avow Hospice’s annual butterfly release and merit-based scholarship and exhibition opportunities for Collier County high school juniors and seniors. 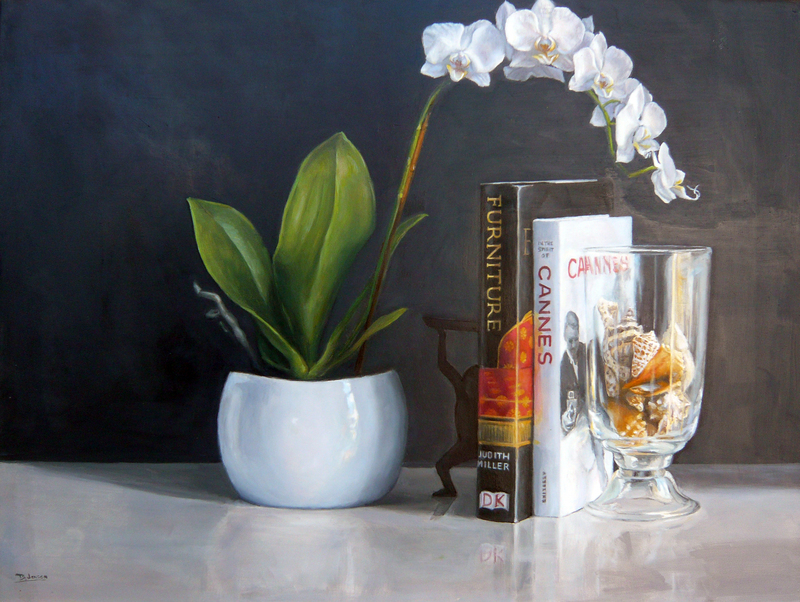 Congratulations to the recent top award winners at the Naples Art Association! 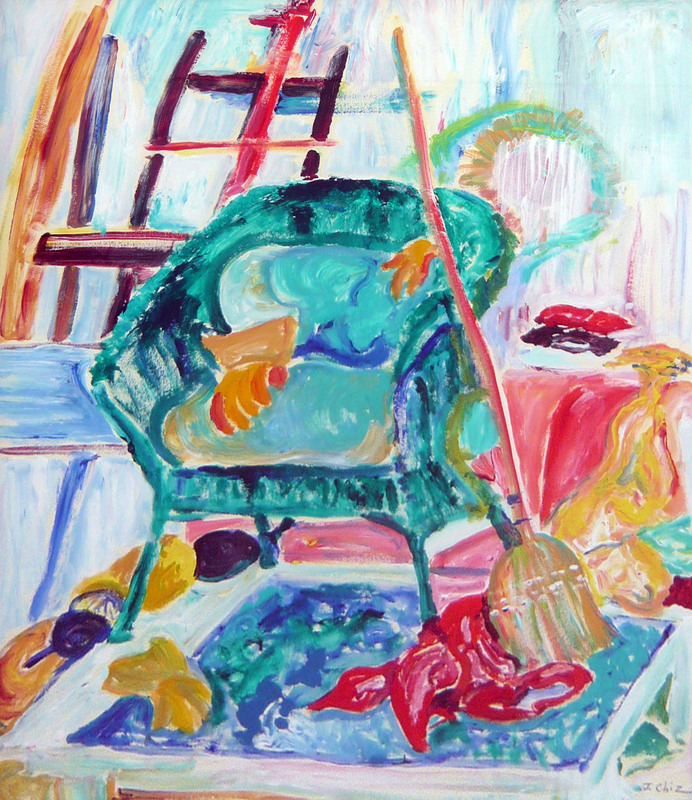 See these artists works and many others in the Members’ Gallery Scene in Naples show and the NAA Adult Student Exhibition 2013, on view through March 16, 2013 at The von Liebig Art Center. 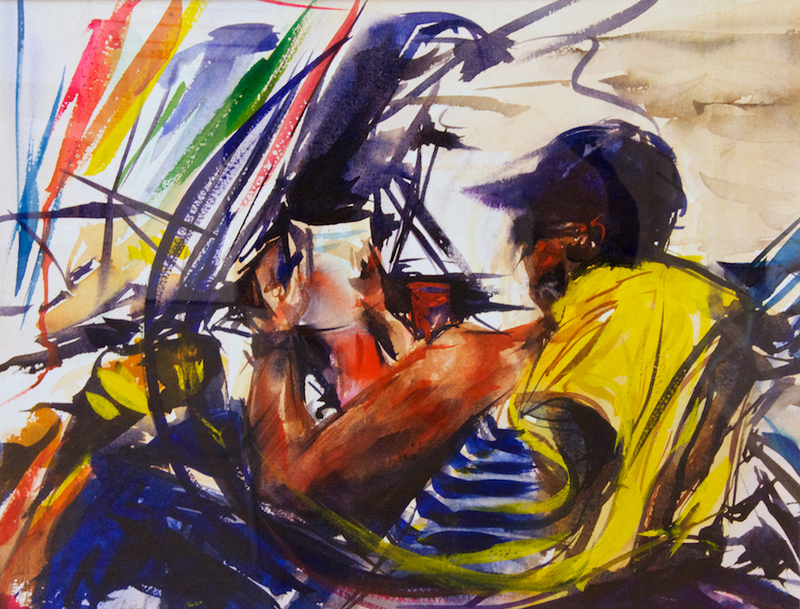 Also on view (through April 13) at the von Liebig Art Center is Following Footsteps: Three Generations of Plein Air Gruppe Painters, in the Watson Gallery. Daily admission to the art center is free and open to the public Monday through Saturday 10 a.m. to 4 p.m.
Mural :”The Relationship between Man and Nature in Old Hawaii” J. Charlote. Fixing, repairing and mending our treasured objects have a long tradition in the preservation of our cultural patrimony. In the twentieth century, the impact of World War II on our cities gave birth to a new profession called “scientific art conservation.” Like in the case of the Sistine Chapel or the United States Declaration of Independence, letter microscopes, spectrometers and x-ray machines are used on the restoration of art and other historical documents. Presenter Viviana Dominguez will take you around the globe, from Spain to Hawaii, to the fascinating world of rescuing art affected by wars, earthquakes and hurricanes. Ms. Dominguez is a specialist in the conservation of paintings and murals in public places. She has worked in the field since 1983, preserving national monuments internationally. Ms. Dominguez has conserved private and museum collections. She is presently working for the Smithsonian Institute as the lead paintings conservator on the SI Haiti Cultural Recovery Center where she participated on the rescuing of many works of art and documents. She is also an educator, and she created the first university level conservation program in Buenos Aries, Argentina. She has recently returned to Lima (Peru), where she taught a conservation seminar sponsored by the J.Paul Getty Conservation Institute. 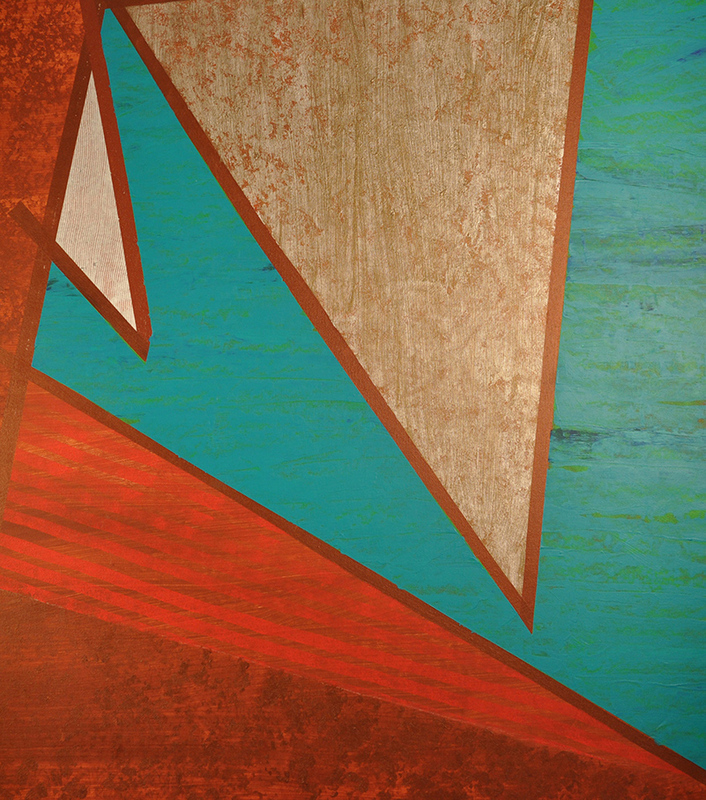 Thursday, Feb. 7, 2013, 5:30 p.m. If you purchased a Lecture Series ticket earlier this year, the cost of this event was included in that. ART Connects is a new program by the Naples Art Association that explores the power of creativity and includes workshops for artists about the business side of their career. Art is everywhere. It’s a historian, a reporter, a therapist, an interpreter, an entertainer a designer. From lessons about culture before our time to seeing today’s world from other perspectives; from creative ideas and inspiration that move us, to expressing our own personality and feelings: The artistic spirit helps us connect. ART Connects explores how.